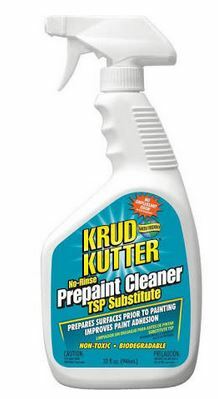 Krud Kutter Prepaint Cleaner/TSP Substitute This product cleans and deglosses prior to painting. This is a no-rinse (wipe-on, wipe-off) formula works great on crayon, dirt, food stains, grease, grime, heel marks, mildew stains, old wallpaper past, smoke stains, wax and more. It helps remove pledge build-up, etc from your piece. We especially recommend Krud Kutter Pre-Paint Cleaner before painting your kitchen cabinets. After using this product; it may be painted over anytime after ten minutes and up to one week later.